As most film fans believe that Halloween, released in 1978, was the start of the slasher film craze of the 80’s. While the film did usher in most of the clichés that would turn up in countless slasher films, it was Friday the 13th, released in 1980 that opened the flood gates. You see, Halloween was a well-made slasher film that did things that hadn’t been done in film before. Friday the 13th, on the other hand, took so much from Halloween and Psycho (the granddaddy of slasher films) and copied it. When Friday the 13th was a hit, every studio wanted to be in the game. Friday the 13th cost nothing to make, yet was one of the highest grossing films of that year. The studios wanted to repeat that success until it died out. Enter My Bloody Valentine, released in 1981. My Bloody Valentine copies the Friday the 13th mold very closely. We have a town where something bad happened in the past that the current residents are now going to ignore because they want to have some fun. The killer shows up and everyone thinks that it is the killer from the past, but the film throws us a few red herrings to keep us off its scent. There are many graphic kills that were butchered by the MPAA and a final reveal that we don’t see coming. Now take the above and apply it to Friday the 13th and you see how close My Bloody Valentine is to it. That is not to say that the film is bad. On the contrary, the film is actually really good. The film starts out with a kill that is nicely shot but doesn’t really add too much to the overall story and could have been left out. A girl goes into the mines that are the backbone of the town. She goes down there so she can bang her boyfriend. After showing what God gave her, the miner (her boyfriend) kills her with a stake throw the heart like she was a vampire. We are then taken to the local town, called Valentine’s Bluff. We meet the locals and get a feel for the town. The town is hosting its first Valentine’s Day party in 20 years. We learn that why. Twenty years ago there was an accident in the mines where many miners died. The accident happened because the men who were tasked to keep the mine secure were at the local Valentine’s Day party. There was one survivor, Harry Warden, who would go on to kill the men responsible on the next Valentine’s Day. He also told the town to never have another Valentine’s Day party or he would come back and kill them all. I love this set up for the film. We are given a good backstory that propels the current story. The town is saying “f you” and holding a party now because they figure that a lot of time has passed and Warden is in a mental institution so it won’t hurt. Boy were they wrong. Before long a man dressed up in miner work gear, complete with mask and flashlight, shows up and starts killing the residents. The kills themselves are a highlight of the film. But you’re saying, “of course they are. This is a slasher film.” and you would be right. 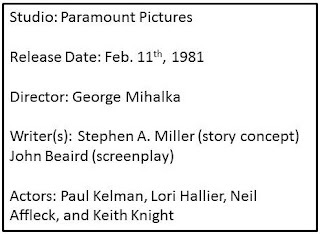 The problem with that is: the audience in 1981 did not get to see the really gory shots because the MPAA would not give the film an R rating unless almost all of the gore was removed. In fact, people who grew up on the film have, until 2009, only seen the R-rated version of the film. 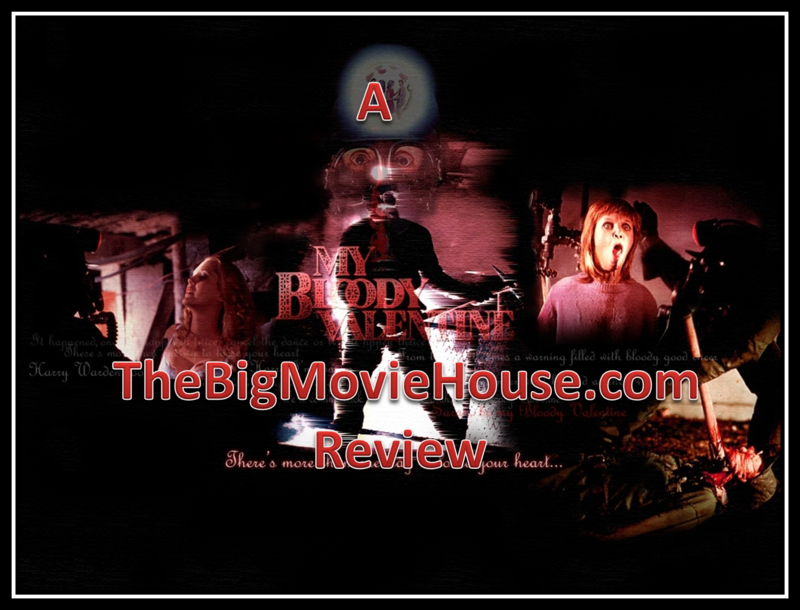 To coincide with the theatrical release of the remake, cleverly titled My Bloody Valentine, Lionsgate released the uncut version on dvd and blu-ray. The cut scenes don’t match the rest of the film in terms of quality (the cut scenes have not been remastered at all), but at least we got them. Also, with the cut scenes being all scratched and worn, there is a certain charm with these added scenes. It adds to the griminess of the rest of the film, even though the rest of the film has been remastered. These scenes are the added gore shots and they are wonderful. Each kill had been cut down so we get extra shots for every kill. There is a kill with a pick axe going in the back of someone’s head and out through their eye. The shots that are cut back in for this scene are horrifying. I have no idea how they did that effect, but it is very effective. For me, this kill is the best one in the film, but I know that each kill has its own fans. Another thing about this film is that it is really good looking. Most slasher films didn’t really care about how the film looked. They just cared whether or not it could be seen. They gore shots were, of course, given special attention, but they rest of the film was given the “light everything so we can shoot it quick” treatment. Here, however, the film looks good. It doesn’t feel like a quickie horror film (although it was. 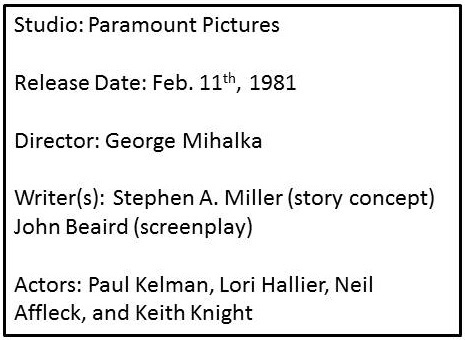 The idea for the film was thought of in August of 1980 and the producers wanted to release the film the following February, just in time for Valentine’s Day. That gave the filmmakers six months to write, shoot, edit, and finalize the film. It is a wonder that they were able to make the deadline and make a good film at the same time.) There are no apparent “day for night” shots and the night scenes are not over lit, giving us some shadows for the killer to hide in. The acting, on the other hand, is not the best. It’s not the worst either, but it could have been better. The sheriff is the standout for his reactions to all the death going on. The scenes where he finds the woman inside the washer at the laundry mat is pure gold in its terribleness. There are some other actors who come across as bored rather than scared. My Bloody Valentine is a really fun slasher film. It takes itself serious enough to not be goofy, but still has fun with the mayhem that is going on. The added gore shots in the uncut version do make an impact and show just how much the MPAA wanted taken out of slasher films. I have to say that the team behind the film really cared about the product that they were making. It wasn’t just a “just get it shot” film. They put in a lot of time and effort and, while the film was not a huge hit at the box office, it stand the test of time as one of the best of its kind. This is a really good film that needs to be seen by more people.